← What to complain about linux’s desktop environment. Assalamualaikum everyone. In this post, I’ll show you a (relatively) new project which I’ve created in about a week or two. It seems to be useful for greater good and so I’ve released the code under the MIT license. The code is available here. 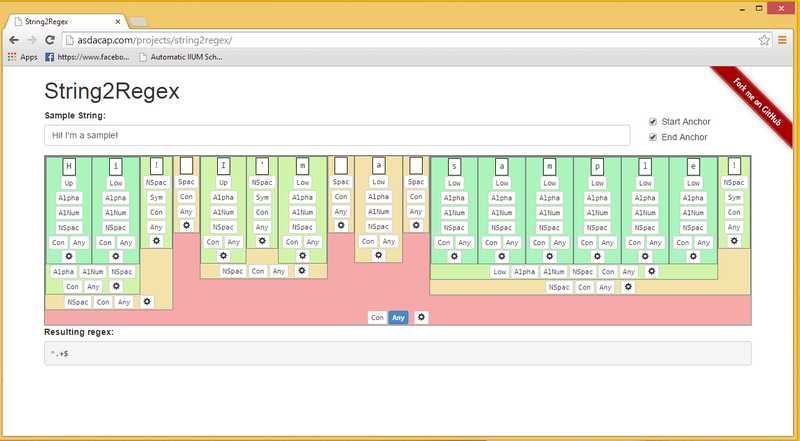 String2regex is basically a clone of txt2re.com but run entirely on client side and not as full featured. The concept is, given a sample string, generate a regular expression to match that string based on user’s selection of string groups. If you don’t know what is regular expression, you are probably not a programmer and this is effectively useless for you. If you are a programmer but you do not know what is regular expression, then you are missing out. If you know what is a regular expression, check it our here and you’ll understand what does it do. This is largely due to some automated testing build with it. The testing is not perfect, as it does not test it entirely and it does not test the view, just the controller logic. However the controller logic is quite complicated (not really) so having some test for that reassure me that it will not crash easily. This entry was posted in Programming, Projects, Uncategorized. Bookmark the permalink.